Mini’s fifth model was presen­ted recently. The Mini Coupé is the latest in the family that now includes the Hatch, Convertible, Clubman and Countryman. This small performance car is essentially a faster, harder and smaller car than any of the previous cars offered by the BMW-owned brand. The Coupé has only two seats but a generous 280-litre boot compensates the lack of passenger space. The wide and high opening tailgate makes loading easier, and the space can accommodate a couple of medium size suitcases or even a pair of skis given the clever opening between the seats that allows for such long loads, as was demonstrated at the launch of the car last month. Inside is familiar Mini territory, with the oversized circular instrument panels more in tune with product design, sporty material and general playful ambiance that has helped make the brand so modern and relevant to today’s market. Plus it features a cute pop-up rear spoiler for an added sporty look. Mini is a unisex brand, seemingly driven by men and women in equal measures. I would even go as far as to say it represents the modern man – someone who is in touch with his aesthetic side but still values driving dynamics. It also signifies the modern woman who is design conscious but not afraid of a bit of go-kart handling. The Coupé, though, is unashamedly pitched at men. Available only in Cooper and John Cooper Works (JCW) versions, it is a niche car offered within Mini’s sportier high-performance range. Even the design is thought to attract more male customers. This was pitched to me as I drove the cars around the Austrian Alps. At first I wondered what I was going to do with such an obviously male-targeted car, but on reflection the gender differences are oh so artificial when it comes to sitting behind the wheel. 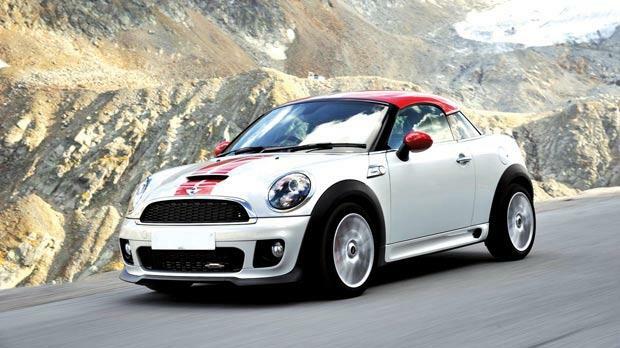 The flagship JCW Coupé is no doubt more of a boy car. It looks racy with the bold stripe running along its hood and bonnet, and its powerful engine boasts the fastest acceleration and top speed of any volume-produced Mini with a 0-62 mph-sprint time of 6.4 seconds and a top speed of 149 mph. In this context it will probably resonate more with male customers. But is the Coupé really such a boy racer to alienate female drivers? The floating roofline that is at the heart of its design adds a somewhat masculine touch. “The roof graphic is almost emulating a baseball cap turned the other way to have an attitude, personality and status,” Anders Warming told me when the car was first revealed. But then the roof can be ordered in various shades, as can the exterior shade and interior trim. “Mini is all about the details – as you spend more time with it you discover new details,” the designer said as he shows me the subtle ambiance lighting inside. The interior offers extended colour options like a mid-brown toffee colour that is new to the range. Surely the Coupé is a car that will appeal to women and the modern man in equal measures.